DNA that used to have some function way back in evolution but currently does not (and might possibly be revived if, say, an ancient parasite reappeared), DNA that controls how genes switch their protein manufacturing on and off, DNA that controls those, and so on. Some may actually be genuine junk. And some (so the joke goes) may encode a message like ‘It was me, I’m God, I existed all along, ha ha. In Terry Pratchett, Ian Stewart and Jack Cohen, The Science of Discworld (2014), 218. 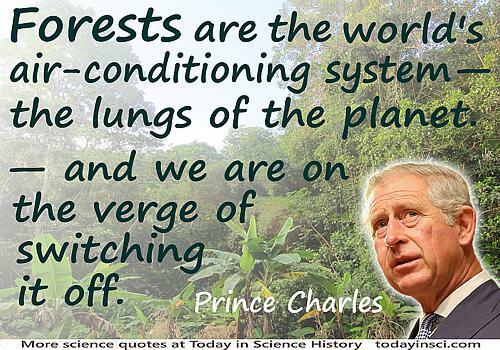 Forests … are in fact the world’s air-conditioning system—the very lungs of the planet—and help to store the largest body of freshwater on the planet … essential to produce food for our planet’s growing population. The rainforests of the world also provide the livelihoods of more than a billion of the poorest people on this Earth… In simple terms, the rainforests, which encircle the world, are our very life-support system—and we are on the verge of switching it off. We’re going to see public attitudes [on climate change] switch not in proportion to scientific findings or graphs, but in proportion to the stories they hear, the people they know whose lives have been touched by climate change or some environmental calamity. That’s what really changed public opinion. From interview with Mark Tercek, 'Q&A With Ramez Naam: Dialogues on the Environment', Huffington Post (1 Jul 2013).